Ever wish you could turn your computer on remotely so it boots up while you’re on your commute home? Or set up a schedule so that all the computers in your office switch themselves on and off so that they’re as energy-friendly as possible? You can do all that and more with software that takes advantage of a featured called Wake On LAN. Wake On LAN (WoL) is a protocol that goes by a host of different names; Power On LAN (PoL), Remote Wake-Up, Resume by LAN. Its actual usage is straightforward: it’s a means of turning on or awakening a computer remotely via a Local Area Network. The protocol works by sending a packet of information around your desired network that contains the unique MAC address of the computer that you want to wake up. If a device is Wake On LAN compatible, it’ll be able to receive this packet even when the machine is in low-power mode — once it gets the message, your computer will burst into life. This is where the interesting part begins; many developers have taken this basic functionality and spun it into very useful programs — here are a few of the best on offer. Straightforward software to use while you get to grips with Wake On LAN. If you’re looking for some basic Wake On LAN software to get started with, this AquilaTech package will likely offer just what you’re looking for. You’ll be able to control Windows machines remotely, waking them up and shutting them down — even scheduling these processes for a time in the future. Aquila Tech’s Wake on LAN allows you to fine tune how and when your computer wakes up. It offers smart features like staggered start-ups to prevent power spikes on large networks. It’s a straightforward, no-nonsense way of testing out whether Wake On LAN can be a useful tool for your network — and it’s free. A more advanced tool for experienced users. Once you have an idea of what you can do with Wake On LAN, you’ll likely be looking for a program with a broad range of options so you can configure your network in a way that suits your needs. WakeOnLan Tool 2 by Marko Oette can do just that, and it does so with a clean interface that’s free from any needless clutter. However, while a novice user could probably get up to speed with this software quite quickly, it’s clear that it has been designed with advanced and expert users in mind. This is a program for people who want to go beyond simply switching their machine on and off from afar. To that end, remote desktop software like VNC and terminal utilities like MSTSC and PuTTY can be set up and controlled from within the program. An intuitive program that can help save power as you download. With AMP WiinOFF can set up a protocol that identifies when download activity on your network ceases — meaning that your download has finished — and instruct your machine to power off automatically. Even better, you can combine this with other conditions; for instance, should you only want this to occur at the end of the day, you can stipulate that the rule is only in effect between certain hours. Comprehensive software well-suited for use in a working environment. For a Wake On LAN program that can really claim to be an all-in-one package, you’d be hard pushed to find anything quite as capable as TeamViewer. All the basic functionality that you would expect is here — turning computers on and off, controlling your desktop remotely — but it’s backed up by features that really put you in full control of your network. You can transfer files, print remotely, and even host online presentations and meetings. This might sound like an overwhelming amount of control, but the way that it’s presented to you ensures that you never feel swamped. That’s part of the appeal of this particular package; it’s all assembled in a way that’s very clear and accessible. Team Viewer is ideal for an office environment, because it gives you the control that’s required to look after a large quantity of machines, but presents it in a manner that anyone can quickly become familiar with. Powerful Wake On LAN tool for your Windows Phone. Wake On LAN has plenty of applications in a working environment, but it can be just as handy as a means of controlling your own personal computer as it is when you’re looking after every machine in the office — especially when you can use your phone to do so. VoiceWake does just that, allowing you to start up your computer remotely via a slick smartphone interface. You’ll need to be running Windows Phone 8.1 to take advantage of this, because one of the major features of VoiceWake is its Cortana integration. Simply set up Wake On LAN on the desired computer and make sure you have forwarded the points on your router as the software stipulates, then it’s as easy as verbally telling your phone to shut down your machine — and it’s off. It’s simple stuff, but it puts you in control no matter how far from your rig you happen to be. We probably all use our computers every day, but do you really know everything about them? There might be many simple and helpful tricks that you’re not aware of. There’s much more to Windows than first meets the eye – you can be a power user for years and still not realise the full potential of the operating system. Let’s run through some Windows features that aren’t highly advertised and which can help you be more productive. Remember to share your own in the comments below! Have you got loads of windows open at once and find your screen too cluttered? In Windows 7 and up, click and hold on the title bar of the window you’re interested in and give it a shake back and forth with your mouse. All other windows will shrink to the taskbar, leaving the window you’ve made dizzy remaining open. This feature is known as Aero Shake. You can get Aero features in Windows Vista or XP using third party applications. Deciding on a single wallpaper to showcase on your desktop is a tricky feat. There’s so many wallpapers to choose from, why settle for one? Instead, right click your desktop and navigate to Personalise > Desktop Background. This will open up a window that lets you set your wallpaper. Select multiple images by holding Ctrl as you click. You can then customise how often you want the image to change and whether the order of the images should shuffle. No longer will you have to see the same image every time you go to your desktop. No-one has time to move their mouse and click taskbar icons! Instead, hold down the Windows key and press the corresponding number to open up that program. For example, Windows + 1 will open the first icon from your taskbar, and so on. Additionally, click and hold on the icons and then drag them to rearrange their position on the taskbar. As you do, their corresponding number will change too. Finally, hold down shift as you click an open window to load up a new instance of that program. If your system is running slower than usual then it’s worth checking out what is slowing it down. Do a system search for resource monitor and bring up the respective program. You can switch between different tabs, like CPU and Memory, to see what is hogging your resources. There are also some Matrix-looking graphs that will offer a real-time look at the usage and strain that each part of your system is undergoing. You probably know about Ctrl + C and Ctrl + V for copy and pasting, but there’s also the lesser known Ctrl + Z. This will undo your last action, such as restoring something that you’ve just deleted on the active window. For example, if you’ve sent a file to the Recycle Bin you can press Ctrl + Z to bring it back to where it once was. This keyboard shortcut also works elsewhere; like in text boxes online to bring back deleted words and the majority of software to revert actions (image editors, word processors, and so on). Some people find User Account Control quite useful, but for others it is more hindrance than help. If you’re not aware, UAC is the feature that pops up every time you’re making an important change to your system. This feature was introduced in order to better protect users and make them aware of their actions, but if you don’t need it then you can turn it off entirely. Perform a system search for user account control, select the result and the User Account Control Settings window will open. From here you can drag a slider to customise your notification settings. The default option is the second highest, but drag the slider all the way to the bottom if you never want any notifications. The information section on the right-hand side will tell you what each notch represents in more detail. This one is for those of you using Windows 7 Ultimate/Enterprise or Windows 8 Pro/Enterprise. Those of you running a different Windows edition, try one of these disk encryption alternatives. Data protection is crucially important and BitLocker is a utility that is on hand to help you encrypt your drives. Right click your drive, select Turn on BitLocker and then follow the instructions to get your files secure. It’s simple, quick and easy – no third-party tools required. Please bear in mind that it is vital you never lose or forget the encryption key to your drive. If you lose this then there’s absolutely no way of getting your data back. Use this feature with great care. Click the Start menu and you’ll see that the default option on the bottom right is to Shut down, with the arrow next door allowing you to extend your options, like restart or log off. It’s possible to customise this if shutting down isn’t the choice you primarily use. To do so, right click Shut down, select Properties and this will bring up a taskbar customisation window that will let you choose your own power button action. For example, you might want to default to sleep if that’s the choice you usually go for. If you have programs that you’re constantly accessing then there’s another way to load them up quicker without clogging up your taskbar. Right click on the program’s icon (often found from the Start menu or your desktop) and select Properties. This will open up the program’s properties and from here you should switch to the Shortcut tab. The field called Shortcut key is the one we care about. Click in the field and press a key of your choice. This key, along with Ctrl + Alt combined, will now become your customised shortcut to opening this program in a flash. The word ‘toolbars’ has a slightly negative connotation in the tech world. It brings about images of third-party junk clogging up browsers, usually accidentally installed from other programs. But toolbars can also be great things, in the correct place. Your taskbar, for example, can do more than just store program icons. Right click the taskbar, hover over Toolbars and then tick the ones you want appearing. The best inbuilt one is Address, which will give you a text field that allows you to navigate to any website through your browser or load any path or search in your system. You might find that some programs offer their own toolbars, like iTunes – this will mean that when you minimise the music player it’ll provide a neat music control panel from your taskbar, saving you loading the window each time you want to pause or change track. Still in love with Office 2007 or Office 2010? Hate to learn the finer points of Office 2013? Calm down. I know that not everyone likes change. But with the ability to parallel install Office 2013 alongside a previous version, you can get the best of all worlds. You don’t have to uninstall the old versions while you dip your toes into the unfamiliar new features like the Design tab . You don’t need to sacrifice your old productivity while you dally around with Office 2013. Don’t go hunting for the document to copy. The shortcut for creating a copy of an Office document is not very apparent but it is a huge time saver if you want to work on a copy while keeping the original intact. Click on File – Open – Recent Documents. If the document was opened recently, the filename will be displayed. Right-click on the filename and select Open a copy. Any changes that you make are saved to the copy. You can then save it at any location. This tiny step is a time saver because you are spared from browsing to its location and manually creating a copy to work on. Working on an important document but have to hit the road? Save your Office documents online via the Microsoft account. Microsoft has the sister suite of web apps for Word, Excel, OneNote, and PowerPoint. Word, Excel, and PowerPoint save the last location where you left off work before saving– to the letter, cell, or slide. Pick up where you left off working on a different device while away from your main computer. You can also continue your work on Mobile apps for Office. Make yourself comfortable. Oh, the things you can do when you stop hating and start doing. If you have a touch enabled computer, Office 2013 was designed for productivity with fingers. The Ribbon menu was restyled and made more functional. I will ask you to do one thing if you are still deciding to come aboard (c’mon, it’s been a year now!). Go to View – Read Mode. That’s a bonus point for a distraction free reading experience. It auto-resizes the document to the full screen and is completely uncluttered. Click on View to see options for tweaking this mode. For instance, the color modes that make it easier on the eyes. You can get rid of the toolbar for a full-screen experience. There’s this quicker way that uses lesser key presses. Using Cut-Paste (Ctrl-x Ctrl-v) to move text from one place on the page to another within a Word document is fine. But try this. Select any block of text. Press F2. You will notice that the status bar (at the bottom of your screen) says Move to where. Place place the cursor at the location where you wish to move the block of text. Press Enter and the selection will be moved. This feature works in older versions of Word as well. Take the benefits of the far improved assistive tools in Windows 8. With the Office suite, you can take advantage of the built-in screen reader (Narrator) to read and create Word documents, PowerPoint slides, Excel spreadsheets, OneNote notebooks, and Outlook email. Microsoft Support recommends that you become familiar with shortcut keys as well. For example, you can use voice to record your comments on PowerPoint slides or a Word document. If you are short on time, use the Narrator to have it read aloud Outlook emails or a Word doc. Microsoft Office 2013 also comes with an audio-enabled Mini Translator that can take a selected foreign phrase and read aloud its pronunciation. Select a foreign word. Click on Review – Translate – Mini Translator. Hit the Play button. Working in tandem with someone else is the shortcut to productivity. And we are not talking about collaboratively editing and tracking changes. Microsoft Office 2013 brings new collaborative features for Word and PowerPoint which piggyback on a Microsoft Account. With the Office Presentation Service your collaborators do not even need the Office suite at their end. A web browser does the job with the help of the Office web app. As the screenshot below shows you, work on your document and begin sharing from File — Share — Present Online. From here, select Office Presentation Service and click Present Online. A share link is created. Send it via Skype, email, or any other online medium. Start your presentation and the recipients get to view it on their browsers when they click on the shared link. Share notes and your team members can follow you through the document. They can also watch the presentation independently. The presenter controls the presentation from this special menu bar. The official Wikipedia app is a quick resource for general research. With the Wikipedia app inside Word. Go to Insert – Apps for Office – Wikipedia. You might have to search for it among the featured apps. The app also allows you to insert a section of a text or an image. Select the text or hover over the image. Click on the insert symbol to insert it into the body of your Word document. The source link is automatically included with the insert. The Wikipedia app can also be used to research something on the side-pane by simply selecting something in your document. Nice. My brain shuts down when I have to analyze complicated numbers. Thanks to the Live Charts feature in Excel, I can give them an instant makeover with colorful charts. In older versions of Excel, charting was one of the more difficult tasks. It wasn’t only about the time it took, but also about the right chart type that fit the data. Excel 2013 makes it easy as a click with Live Charts. Excel uses a special algorithms to show the chart types you can use based on the data. Select the data to chart and click Insert — Recommended Chart to see options such as line, bar, and pie charts that Excel feels is right for your data. Click each chart to preview what your data will look like. Pick the right chart and Excel inserts the chart with some page elements to work with styles, colors, and the chart data. Do note: Not every chart type is recommended. Specialized chart types are available from the Insert Chart button on the Ribbon. From PDF to editable Word documents. One of the best features of PDFs are that they are not editable as a default. It’s also an irksome feature if you want to take information out of it. A whole industry of tools exist that help you be more productive with PDF files. Don’t disregard the new (and I bet, underused) PDF Reflow feature in MS Word 2013. Making it uncomplicated – open a PDF with Word 2013 and it will behave like a normal Word document. You can reuse the content without too much effort. Now, all that rich data locked in PDF files is ripe for picking. Word creates a copy and opens it as a normal document as you would any other from File – Open. Make any changes…the original PDF is left intact. The conversions are not always perfect, but this is a very handy feature. Microsoft Office has seen eight versions and a number of users that’s close to the population of India. It’s safe to say it has done its bit for our productivity, simply by leading us to a more paperless life. Just ten productivity tips for Office seem like three seconds of a Christopher Nolan movie. We promise there will be more. Once upon a time, LogMeIn was the go-to remote desktop service. But TeamViewer has always been the superior alternative, even more so since LogMeIn ended their freemium model. If you’re new to TeamViewer, it is an excellent, feature-rich, and free program (for private use) with an intuitive interface. Granted, they do have premium features you can upgrade to, but as we explore the ins and outs of TeamViewer, you’ll discover the “basic” free program has all you need in a remote desktop client. It’s very rare that one program works for everything across the board, but TeamViewer does just that – Mac, Linux, PC, iOS, Android, Windows Phone, Windows 8/RT. So whatever you and your clients/friends/family use, TeamViewer is all-inclusive. Whether you need to help several people or want to access a second computer while helping someone else, the multiple sessions feature enables you to do that. In the top left corner, you’ll notice a “+”, which launches a new tabbed session within the same window. Often times you might wish to review a session in order to remember something or to refer back to when you helped someone with tech support. While connected, go to “Extras” and “Record” in the toolbar at the top. Then you’ll see three options: Start, Pause and Stop. While a recording is in progress, a “REC” symbol (like on those old-fashioned video tapes) will appear in the top right corner of the window. Upon stopping the recording, you’ll be prompted to save the session file. The video file is opened and played by TeamViewer and can even be converted to other video formats. Though there are some excellent ways to share files, having a constant medium to do so makes it so much simpler, especially when working with folks who are “computer illiterate”. To do this, go to the TeamViewer toolbar, then “File Transfer”. You’re presented with two options: “File Transfer” (access files to share from your PC) and “File Box” (drag and drop files to share). Need to send a file, but don’t want to hassle with connecting to another machine? Go back to the primary TeamViewer screen as if you were to remote connect, but instead check the “File Transfer” option, then click “Connect to partner”. Simply move the files by dragging and dropping. The third option is to go to the Computers & Contacts windows, right click the user/computer you want to send a file too, and click the “paper clip” icon. Various visual settings can be modified to bring in the feel of actually using the computer you’re remote connecting to, or to optimize the speed and decrease resolution for slower connections. You can do this by going to “View” in the TeamViewer toolbar (while connected). You’ll be presented with several options: “Quality”, “Scaling”, “Screen Resolution”, as well as “Show whole desktop”, “Remove wallpaper” and others. Also note the “Full Screen” button below the “Extras” menu. There’s no reason to download a 3rd-party chat client or call the person – TeamViewer’s integrated chat feature takes care of the hassle. This will appear on the top right side of the screen, and may be minimized on default. Just click the small “arrow” and the chat window will expand. From here you can immediately use text chat or audio/video call the person. You’re in a jam. You don’t have your laptop, but you need that file now! t’s never been easier with TeamViewer’s apps for almost every mobile platform: Android, iOS, Windows Phone and Windows 8. You can use it to access files and control your or someone else’s computer. In addition to being versatile and accessible, mobile interface is simple and intuitive to operate. Perhaps you want to do a presentation, or need help only within a specific program. If you don’t want to show your whole computer off, you can click the double arrow in the top right corner of any window while TeamViewer is running and select the contact you want to share the window with. Sounds basic, but one of the most useful ways TeamViewer can help you is if you create an account. Can you use TeamViewer without one – of course, that’s the beauty. But with an account, you are able to set a personal password, log into any of your TeamViewer-enabled devices and so much more. To do this, go to “Connection” in the upper right corner of the TeamViewer window and click “Setup unattended access”. Follow the directions to for a Computer name and password and you’re done! Can TeamViewer get any more accessible? Yes it can – through any browser. Simply sign in and you can access any of your contacts’ or your own devices. You get the same remote control functionality, but all within your browser – super helpful if you need to access your device or help someone from a public computer or while at work. Though TeamViewer works great with its default settings, to get the most of it, you should really take a look at all of its options. Go to Extras > Options and scroll through the various side tabs from General to Advanced. Whether you’ve been using TeamViewer for some time, but didn’t know about some of these features, or you’ve been searching for a solution to your remote control needs, TeamViewer is one of, if not the best remote access service available. Hopefully these tips will help you get even more out of TeamViewer. Here at geek central, we’re in the business of making things as easy as possible. There’s a registry hack for Windows that will let you add a Copy To Folder or Move To Folder to the right-click menu, which can be very useful when you want to move a file but don’t have the other folder open already. And up pops a nice dialog that you can use to easily drop a file into the right directory. Just download, unzip, and double-click on the registry files. You can choose to use the copy to, move to, or both. Uninstalling an app that you have installed on your Android device from Google Play is simple — but what if you didn’t install it? What if the app you’re trying to remove is one of those that came pre-installed on your device, provided by the manufacturer, your mobile network, or as a part of Android itself? Removing unwanted system apps from Android can be tricky, but it is not impossible. Before you start deleting apps, however, you should spend a few moments considering just why you want to get them off your phone. For instance, it might be that they are cluttering up your home screen. If this is the case, then long tapping and dragging to the Remove box at the top of the screen should get them out of the way. On the other hand, these apps might be considered “bloatware” and take up valuable resources. Pre-installed games might take up space on your phone’s storage, while Internet-connected apps could be eating into your monthly allowance. Such apps might even be recording and/or uploading information that you would prefer they didn’t. And then there’s the impact on your battery life. Unfortunately, removing these apps isn’t as easy as it could be. It really depends upon whether your Android device is rooted or not. Deleting apps isn’t possible in most cases, but what you can do is disable them, or on older versions of Android, hide the ones you don’t want. Prior to Android 4.4 KitKat (which you should now be using to protect against the stock browser bug), you could open the app drawer, tap the menu and select Hide Applications before selecting the apps you wished to hide and then tapping Done to finish. For devices running Android 4.4 KitKat, you should go to Settings > Device > Apps and find the app that you want to remove. Select Force stop and then Disable — you won’t be able to delete the app, but it will stop running on your phone, never to be seen again until you perform a factory reset. This isn’t a great solution, admittedly, as there are some apps that cannot be disabled in this way. Should you find that this doesn’t suit you, there is always the option of installing an app launcher replacement. Any app can be removed from a third party launcher, but remember that it will still be on your phone, hidden away in the background. In most cases disabling and hiding an unwanted app is just as good as removal. For those of you who have rooted their phones (a universal method of rooting doesn’t exist; you’ll have to head over to the XDA-Developers forums to get an idea of where to start for your model), the matter of removing unwanted pre-installed apps is a little easier. This is a good, free solution that removes pre-installed bloatware and makes backups too — after all, you wouldn’t want to delete the wrong app and end up with a featureless phone! A premium version is also available for $1.99 (£1.25), offering some enhanced features such as blacklisting system apps. Arguably the first app you might think of for dealing with unwanted apps on your Android Device is Titanium Backup. It can handle any app you throw at it, whether downloaded from Google Play or pre-installed. The free version allows you to backup and uninstall apps, but the paid version ($5.99 or £4.11) allows you to freeze apps and more. This app offers an easy way to remove apps while also proving the tools to move apps to your SD card, should this function be required. Although ad-supported, System App Remover seems to be faster than the other two options in removing pre-installed system apps. A final option you might want to check out is a simple bulk uninstall tool we reviewed a while back that focuses entirely on batch uninstalling apps in a clean and easy way. Check it out if the above options don’t tickle your fancy. There is one other solution for removing unwanted apps from your Android device: flash a custom ROM. While it might take a bit of research to find out which new ROM will fulfill your needs, the solution can leave you with a stripped-back version of Android that you can keep particularly close control of. OmniROM and Paranoid Android are two examples of custom ROMs that are designed for users with an eye on performance and privacy, and these are two key reasons why you might want to kill the bloat on your phone. You should definitely consider these an option, especially if you’re already rooted. Did you know that you can remove unwanted system apps from Android? Do you use any of the Android app removal utilities or methods described here? Or do you have a favourite app that we haven’t mentioned? The Android operating system has come along leaps and bounds since it was first released in 2008. Although initially the red-headed stepchild of the smartphone world, it has since become the leading platform, overtaking Apple’s iOS in popularity, and beating off any new challenge from Windows Phone 8 and Blackberry 10. But what is the reason for Android’s dominance? Perhaps it’s because of Google’s proactive approach to introducing new features, whilst simultaneously refining existing ones on a regular basis. And Android Lollipop is no different, bringing to the table some incredible refinements of the OS’s look-and-feel, as well as features that are sure to delight users. You can get some of Lollipop’s best features right now, but here are the five most important we’ll be seeing. One of the biggest criticisms of Android has been that it simply isn’t all that nice to look at. Sure, that was certainly true prior to the release of Ice Cream Sandwich. Since then, it’s undergone a number of revamps of its aesthetics and its usability that have drastically improved the Android user experience. The latest iteration in this process is something called Material Design. This standardizes how third-party applications function, making the aesthetics of said apps a bit more uniform. It also standardizes how Android should look across devices, from tablets to phones. In short, it makes the platform even more beautiful, and even more usable. For further reading on this fascinating topic, we recommend you read up on the design details of Material Design in our in-depth look. Have you ever found yourself rudely awoken in the early hours of the morning by the chime of your phone whenever someone sends you a Facebook message? It’s annoying. Thankfully, Android Lollipop solves this once and for all, with its revamped notifications system. You’re now able to easily adjust your settings, ensuring that only specific notifications from specific services go through. You can also set your phone to turn notifications off entirely for a set period of time. And you don’t even need to use a third-party app, like Echo, the lockscreen replacement app. Handy if you’re in bed, trying to get some shuteye, in an important business meeting, or in class. Application Programming Interfaces (APIs) are used by developers to create the third-party applications you love to use. Part of the reason why Android has been so successful is the openness of the platform, and the ability for developers to extend and enhance it as they see fit. That’s not about to change, as Android Lollipop introduces over 5,000 new APIs for developers to use, including support for OpenGL ES 3.1 and tools for taking advantage of the more powerful cameras found in high-end Android phones. Happy coding! The battery lives of smartphones are notoriously short. Sure, there are ways to make this less of a problem. You can buy an external battery or a solar charger. You might even want to turn off mobile data entirely, to squeeze an extra few hours out of your phone. Android Lollipop tries to fix this with a new battery saver feature. Switch it on, and you get another 90 minutes before you have to plug your device in. Developers are also able to invoke this battery feature from within their code, thus minimizing the impact applications have on your battery life. For a while now, sales of PCs have been falling. The reason? They’re being replaced by tablets, which are often cheaper, easier, and come with a smaller risk of malware. Google is very much aware of this and has enhanced an already existing feature that makes Android Lollipop function much like a PC does. User accounts. Much like Windows Phone’s Kids Corner, you can restrict access to applications and private files, depending on who will be using your device. Android Lollipop also supports guest sessions, so you can let people use your phone or tablet without having to give them your password or resorting to any inelegant hacks. Cool, right? Windows 10 has been announced, and you can try the Technical Preview on your PC now. As you’re trying it, you can help Microsoft polish the preview version by joining their Windows Insider program. However, installing Windows 10 comes with some risks, which is why you should really install it either in a virtual environment or on a second device. Windows 10 is set for release in 2015. Until then, there is a lot of work for Microsoft to do, and with your help they hope to bring us the greatest version of Windows yet. So if you’re interested, forget the fact they skipped “Windows 9″ and head to http://windows.microsoft.com/en-us/windows/preview where you can sign up to the Windows Insider Program and download the Technical Preview release of Windows 10. When you download the Technical Preview you will find a Product Key for you to use along with a selection of links to different international 32-bit and 64-bit versions. Make sure you use the correct version for your system. While previous 32-bit Windows releases would install on 64-bit hardware, the Windows 10 Technical Preview does not. The download is in ISO format, which means you can mount it on your own device to browse the contents of the disc and burn it to DVD or write it to a USB stick. You really shouldn’t install the Windows 10 Technical Preview on your current, live Windows device unless you know what you’re doing and understand the impact this might have on system stability. Unexpected PC crashes could damage or even delete your files, so you should back up everything. Some printers and other hardware might not work, and some software might not install or work correctly, including antivirus or security programs. You might also have trouble connecting to home or corporate networks. If you want to risk this, then the best thing to do is ensure your system is properly backed up, that you have copies of your data on external drives or cloud storage, and that you have a copy of Windows 8 on DVD or USB to reinstall from – you won’t be able to use the Windows 8 recovery partition as you cannot downgrade from Windows 10! Whichever device or installation method you plan to use, only install the Windows 10 Technical Preview ISO once you are fully prepared. The steps outlined here can be followed whether installing as an upgrade or onto a clean partition. Computers running Windows 7 and later can be upgraded to the Windows 10 Technical Preview via the downloaded ISO, once burned to DVD or written to a USB flash device. You can use Rufus and to create a bootable USB with the Windows 10 TP ISO. Also make sure to allow booting from USB in the BIOS. Note that systems you think might be compatible could in fact disappoint you, so to quickly find out how compatible your system is, attempt the upgrade method. With the disc in the tray or the ISO mounted, the installer should autorun. Begin by agreeing to the licence terms, then selecting your preferred language, date & currency settings and keyboard language, and click Next. In the following screen, click Install Now to get started, and wait as the OS installs. How fast this happens will depend on the speed of your hard disk drive and DVD drive. Once complete, you’ll be able to choose between Use express settings and Customize, just as with Windows 8. If you own a Windows account already, (which you will have needed to download the Windows 10 Technical Preview) you will probably know that you can use this to sign into your virtual PC. You may use this for Window 8 already, or your Xbox 360 or Xbox One, or Windows Phone. With Windows 10, signing into the computer with your usual account will result in changes being synced to the cloud. There seems to be some sort of hierarchy of versions which will mean that the changes made to your Start screen (such as the chosen theme colour) will reflect on your Windows 8 Start screen, so be careful with the choices you make. To avoid this happening, create a local account for Windows 10 Technical Preview (select Create a new account > Sign in without a Microsoft account) or else use a different Microsoft account. Justin’s guide explains more about user accounts on Windows 8, information that applies to Windows 10. With the account set up, Windows 10 will proceed to install apps. This will take a few moments, and then Windows 10 will start. No Spare PC? Install On A Virtual Machine Instead! If you’re missing the option of a spare PC and want to try the Windows 10 Technical Preview, your best alternative is to download the ISO and install it on a virtual machine. Oracle’s VirtualBox is probably the best option here, particularly as it is open source and regularly updated. You can download it from www.virtualbox.org/wiki/Downloads. Already using VirtualBox? Make sure you update to the latest version before attempting to install the Technical Preview – if this doesn’t happen automatically when you run the software, open Help > Check for updates… and follow any instructions. With the app updated, restart and click New. Name the operating system Windows 10 and select Windows 8.1 in the Version dropdown, specifying whether your ISO is 32-bit or 64-bit. Move through the wizard accepting the recommended settings (ensuring you have sufficient hard disk space for the VM) until the virtual machine has been set up, and click Start. At this point, the virtual machine will boot, ask you where the ISO file is (it might be on DVD or on a HDD) and installation will commence as described above. Problems may occur with VirtualBox. If it reports a lack of RAM, make sure all other programs are closed. Failure to install can also be related to the host PC’s DEP settings. To adjust these, open System Properties, click Advanced > Performance and in Settings open Data Execution Prevention. Here, change the setting from Turn on DEP for essential Windows programs and services only to Turn on DEP for all programs and services except those I select. Not keen on a virtual machine or installing over the top of your current OS version, but still want to try Windows 10 and don’t have a spare PC? Let’s try the VHD method, which is ideal for trying out a new modern Windows OS without messing up everything else on your system. Note that a system encrypted with BitLocker cannot use this method. To try this, you’ll need a computer with 64-bit Windows 7 or later (Ultimate or Enterprise, although the version shouldn’t matter on Windows 8 machines). You’ll also need the installation media: 32-bit or 64-bit should work equally well. Prepare beforehand, ensuring you have at least 20-30 GB depending on whether you choose the 32-bit or 64-bit version. For using Windows 10 Technical Preview for more than just evaluation, you’ll need twice this amount. Begin by downloading the ISO as described above, writing to USB. Some guides online suggest that you use Microsoft’s own ISO-to-USB writing tool, however this automatically writes in the NTFS disk format; if you’re using a Windows 8 or 8.1 computer, you’ll need the USB drive to be formatted as FAT32. You can deal with this quickly with the Windows Explorer format tool (remember to set as FAT32), then mounting the ISO file and copying the contents of the virtual DVD to the USB device. Next, open Computer Management (open File Explorer, right-click My Computer > Manage) and expand Storage > Disk Management. Here, select the drive you’ve made space on, then open Action > Create VHD. Here, browse to the location you wish to create the VHD and give it a filename, and make a note of these details for later. Next, set a Virtual hard disk size (25 GB upwards), ensuring that VHD is selected in the top section and Fixed Size in the lower. Click OK to continue, and watch the lower right corner of the Computer Management screen where a progress bar illustrates the creation of the VHD. Once complete, Computer Management will show a brand new device of the size specified. Make a note of this, as well. The next step is to reboot your PC, with the USB stick connected. Windows 7 users will need to look for the message to press a key to boot from the external device. For Windows 8 users, this is best achieved by opening Run (WINDOWS + R) and entering shutdown.exe /r /o /f /t 00. In the Windows Recovery Environment, select Use a device and then select your USB stick. In a moment, your system will be booting from the Windows 10 Technical Preview disc and ask you to begin installation; do so, but pause at the Which type of installation do you want? screen. Here, tap Shift+F10 to open the Command Prompt and check the location of your VHD. This might be C:\VHD or it might be the drive number allocated in Computer Management. Use the dir command to find the contents of each drive and directory where you believe the VHD to be. Now, select the Custom: Install Windows only (advanced) option, and you’ll be asked where you want to install Windows. Select the new drive (ignoring the message that “Windows can’t be installed on this drive”) and click Next. Setup will now proceed, with the few steps required as described above. Once Windows boots, you’ll still have the same hard disk drive (or SSD) but it will now have a virtual partition on it, displayed by Windows as a genuine partition with Windows 10 Technical Preview installed in it, but in actual fact it is essentially a file. When you’re done testing Windows 10 TP, open the location of the VHD and delete it. You will also need to open MSConfig, switch to the Boot tab and delete the entry for Windows 10. Conclusion: Help Microsoft Improve Windows 10! As you use Windows 10 Technical Preview, you will notice popup messages in the corner of the display. These are questions from Microsoft asking you to rate and give feedback on features. Never before has Microsoft asked for feedback in this way from such a large group of users, evidence it would seem that they are taking complaints about Windows 8 very seriously. There were so many new features and tweaks built into Windows 8.1 that it is easy to miss them, so here is a quick guide to some of the best additions. To keep up with app updates in Windows 8 you had to do it yourself through the Windows Store but in Windows 8.1 that is no longer necessary as they automatically update; you just need to activate them to do so. You can do this by launching the Windows Store and opening Settings, then select ‘App Updates’. Organising and editing apps and live tiles is so much easier in Windows 8.1. You can now edit several apps all at the same time, which saves you time when compared with the old way of sorting through your applications. Enter the Start Screen’s customised mode by right-clicking on an empty part of the Start screen and then select customise from the bar on the bottom of the screen. You can now move, re-size and delete as many or as few apps as you want. Keeping on the app theme, did you know that dragging apps down off the bottom of the screen (like you did in Windows now only hides them? To restart an app you need to drag it down to the bottom of the screen until just the top of it is showing. Hold it there for a few seconds until it spins around, displaying the app’s icon. Although not supported on all hardware, Windows 8.1 has a new panoramic photo feature. In addition, the Photo Loop feature let’s you take lots of photos in quick succession so that you can choose the best one. I think this is a really handy feature and it has saved me so much time. If you right-click on the Start button the secret Power Menu will pop up. Hover over ‘Shut down or sign out’ and you can then choose from a list of log off options. They say that a change is as good as a rest so don’t just stick with your same old lockscreen image. If you go to the Settings charm and navigate to Change PC Settings>Lockscreen, you can then toggle ‘Play a slide show’. Watch the screen turn into your very own digital photo frame. If you would rather see a list of apps on your Start screen rather than all of those big tiles then just turn the Start screen into an app launcher. From the desktop right-click the taskbar and select ‘Properties’ and click the ‘Navigation’ tab. From the Start screen section enable ‘Show the apps view automatically when I go to Start’. Because Windows 8.1 combines mobile and desktop features, you’ve probably noticed that every time you get a message, you get an app notification ping. Although this feature in itself is useful, it can be a nuisance. 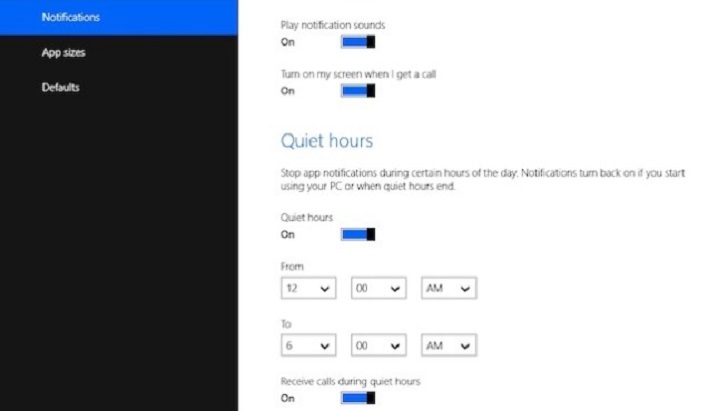 The ‘Quiet Hours’ feature silences any notifications at set times, giving you some peace and quiet. Head to the Settings charm and then navigate to ‘Change PC settings’. Select ‘Search and apps’ followed by ‘Notifications’. One new feature is really well hidden in the Food and drink app. If you have a touchscreen device, the last thing you want to do is navigate through a recipe with sticky fingers; that’s where the hands-free mode comes in. Rather than touching the screen, just wave your hand in front of the webcam to go through the various steps of your recipe. Genius! Western Digital’s HGST have announced the world’s first 10-terabyte hard drive and it’s helium-filled to boot. The Ultrastar He10, comes just a couple of weeks after Seagate announced the initial availability of their 8TB air-filled hard drive. The company has failed to disclose any pricing structure as yet but Western Digital have said that the 10TB drive will have the lowest cost-per-gigabyte and power consumption-per-gigabyte of any HDD drive that is currently available on the market. In a recent press release, WD’s HGST announced a load of new products and initiatives. Here we will take a peak into the top three. 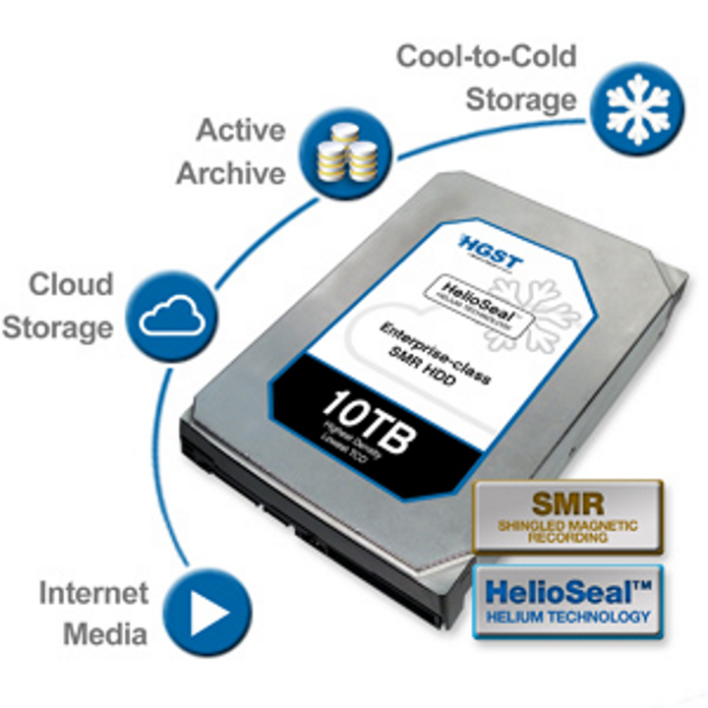 1) HGST is sampling a helium-filled 10TB hard drive. 2) 8TB helium-filled hard drive that will come to market a bit earlier than the 10TB unit. 3)WD now has a standard air-filled 6TB hard drive (the Ultrastar 7K6000). First up is the new new 10TB hard drive uses the same HelioSeal technology that has its debut back in November 2013. HelioSeal basically means that helium is hermetically sealed inside the drive (it is unable to escape) And because of this, air and any contaminants cannot get in. A drive which operates in a helium environment provides a lot less resistance than normal air, thereby allowing more platters to be utilised ( while still using less power. Apparently the power consumption of helium-filled drives at 23% less than their own conventional air-filled drives. HGST’s 10TB drive uses shingled magnetic recording (SMR) to increase areal density, while the 8TB drive uses standard magnetic recording (PMR). HGST says the performance of SMR is not yet up to that of PMR. Because of this, the drive is being marketed for cloud and cold storage, where access and read/write speeds are not as significant. The He8 uses seven big platters of 1.2 TB each, in respects is no different from the earlier He6 6TB or for that matter the upcoming He10 10TB models. I would imagine that this is the drive that WD is pitching against Seagate’s own 8TB drive. Finally, WD is currently shipping a standard air-filled 6TB drive, the Ultrastar 7K6000. This drive has just five platters, of 1.2TB. This makes Western Digital the “areal density leader” apparently, implying that Seagate has not yet discovered the secret to producing drives with 1.2TB platters. Again there is no concrete pricing structure. The air-filled Ultrastar 7K6000 should start around $400. The original helium-filled 6TB Ultrastar He6 is now down to around $500. But there’s no price yet on the 8TB Ultrastar He8, but you are going to be looking at around $1,000 . OneNote is one of Microsoft’s most underrated apps. Not only can you jot down notes or keep to do lists, you can use a stylus to do it, convert handwritten notes to text or organise your recipe collection. OneNote is available on almost every platform, making this ridiculously useful app even more relevant. Although OneNote is available with good functionality on mobile devices, the tips below are mainly intended for running OneNote 2013 on Windows and Mac OS X. Ever arrived at the supermarket and found that you forgot what you went for? Even on a paper-based list, it’s easy to forget things if you haven’t got a pen to mark them off. Back in 2010 when Windows Phone was released, one of the advertisements (in a Microsoft “multi-product” ad that also promoted Windows 7) featured a dad going shopping using OneNote on his phone as to view a shopping list that was updated by his cheeky sons as the trip went on. This was possible by using the same Microsoft account on the phone and the version of OneNote that was used to create the list. You don’t have to use a Windows Phone to create and use a shopping list in OneNote, however, as the note-taking app is now available for Android and iOS (as well as Mac OS X). Simply create a list on one device, select the items and select Tag as To Do to add check boxes. While you’re shopping, mark off items as you go – and look out for your significant other sneakily adding 12 bottles of wine to the list! If you’re a bit of a foody (and if you’re also a Windows 8 user there are plenty of useful apps for you to gather recipes!) then it might interest you how easy it is to manage recipes in OneNote. You can approach this in different ways. Begin by creating a new section in your notebook and labelling it “Recipes”. You can use the camera on your mobile device to snap recipes in books and magazines or use the Print function in your browser (choosing OneNote as the printer) to add recipes to this new section, organising them onto individual pages for each recipe, or perhaps each meal type. For those using a device that recognises handwriting, you can also use your finger or stylus to make notes on the recipe as you cook – perhaps a measurement has been printed incorrectly, or you need to make a temperature adjustment for your fan oven! An amazing way of using OneNote is to adopt it as an extension of your newsreader app. It sounds pretty unlikely, but is made possible thanks to IFTTT, which has recently launched a OneNote channel. A number of different integrations are available, enabling many recipes, and we think that this is one of the best. The recipe uses Feedly and enables you to set posts you enjoyed in the news reader app and set as favourite in OneNote. This is particularly useful as it saves you having to track back and find them later on, and of course OneNote will sync the content across devices, making it easy to find. Note that the MP3s will become part of the document while you work, and if you use OneDrive they’ll also be synced with the cloud, so you may want to avoid an unrealistically large file size by removing the tracks from OneNote when you’re done with the page. This is a variation on using OneNote for interviewing. If you’re a musician or singer songwriter and want an easy way to record tracks and keep all music, notes, chord changes and lyrics on the same screen, OneNote is a really good way to do this – and it lets you record at the same time! Following on the suggestion above, you might wish to transcribe the contents of a historical document quickly so that you might share it with others researching similar records. Alternatively, you might use OCR as a quick note-taking tool – it’s particularly useful for writers who have kept press clippings about particular topics. If you have a good reason to collect receipts (for expense claims, perhaps) then this functionality can help you save a lot of time looking for expenses that you wish to claim from your employer. Planning on trying this out? It’s a good idea to start a new section especially for receipts, and to group them by month-to-a-page. Whether you’re handy at using your mouse or you have a touchscreen device with an accurate stylus, a great use for OneNote is planning things out – in particular, the branches of a family tree. You might be learning about your family tree for the first time or be an experienced researcher in this field, but it’s always good to have something you can jot down and share instantly. OneNote’s ability in taking down notes and illustrations makes it a great option for anyone wishing to create a quick outline of ancestry. However you might also go further, dedicated single pages to each individual in your tree where you can add notes and images as facts are uncovered. A quick browse of the IFTTT OneNote channel (see above) will reveal a lot of useful automations, but one of the most effective is the creation of a photo journal using the images uploaded to your OneNote account. Each time you create a new photo in Instagram, it is synced to your OneNote notebook, enabling you to create a record of your images in a more accessible, browsable form. The possibilities here are strong: you might convert the notebook into Word or PDF format (using File > Export) and then have the book printed using a POD solution such as Lulu or CreateSpace. We heard way back in April that the much beloved Start menu would be returning, now updated as fully Windows ecosystem integrated search feature, serving results from your personal indexed locations and the Windows App store, offering comprehensive search functionality in a familiar location – more on this later. The new look Start menu appears to be fully interactive, allowing for resizing, relocation and reconfiguration of each tile as part of a fully customisable experience, porting the sometimes frustrating and seemingly endlessly scrolling Windows 8 Start menu interface into a bite size, functional work tool. New Icons Are Nice, Too. The leaked screens indicate a smattering of new icons across both the traditional desktop and the modern interface experience formerly known as ‘Metro,’ providing updates on the UI style established with the release of Windows 8 and now found across the Windows digital and mobile spectrum. This is part of a wider shift in the focus of Windows toward expansion of their mobile and tablet sales through desktop and mobile integration, similar to the continued merging of all Apple products: one UI, one cloud, a united vision for integration. Two of the most exciting aspects of Windows 9 will be virtual desktop support and the introduction of the brilliant Cortana to our home screens. Given Windows previous commitments to its virtual assistant Cortana, it seems likely she will appear in some format (Paperclip, anyone?! ), most likely as a wholly unified aspect of the search function whose icon you will note nestled next to the Start menu, essentially making the taskbar her domicile. The second interesting leak development has been virtual desktops. Windows 9 offers the chance to create distinct workspaces on the fly that will presumably – as part of the wider networking and integration efforts being undertaken throughout the company – come with or work well with a wider network sharing tool for community/office/social online workspaces. On a more basic level, simply having a desktop configuration for home, work and play could prove handy for those looking for more. Particularly interesting and of massive productivity potential is the popup overlays for each desktop, allowing an interactive insight into each virtual workspace. No more endless scrolling through open windows via ALT+TAB, only to miss your scheduled stop. A potential nightmare for employers, however, with employees cycling through from Excel to their office game of OpenTTD and back again. Productivity and integration seem to be central to the ‘new’ Windows ethos. The introduction of Satya Nadella as Microsoft’s CEO has promoted a company-wide unification message, clearly enacting a vision of a merged, integrated future for all Windows desktop, mobile and Xbox devices. Productivity is key to the success of Nadella’s future and indeed, the continued future of Windows 9. Shifting quickly between screens, integrated desk applications and wider Windows device support all point to a serious Microsoft, pushing to and beginning to truly understand their role in the contemporary digital market. It seems that Windows 9 will be provided to officially licensed users as a free upgrade (or for $20, where applicable) and potentially to new users also. In recognition of our social mobile concentrated society and the shifting demographics of desktop users, updates are likely to come in smaller, more frequent packages to enable continued development – though according to Microsoft coverage savant, Mary Jo Foley, there is another, more consumer focused preview (see Windows 9 running on ARM processors) on its way to establish what has been built with tablet and mobile users in mind. If your computer fans frequently hit top speeds, it’s a sign that your CPU is fully loaded. Simultaneously, your computer may slow down. That’s annoying, especially if you’re not actually doing anything. The CPU (central processing unit), also known as processor, is the brain of your computer. Like your own noggin, it can become overwhelmed if bombarded with too many processes, or if a single task consumes undue attention. Just as you may find work difficult when overwhelmed, your processor can slow to a crawl if too much is asked of it at once. Normally, this situation can be avoided by staying away from demanding apps, but CPU usage can sometimes go out of control because of a bug in a process, such as the infamous WmiPrvSE.exe. Fortunately, high CPU usage is usually easy to fix. This process, which has the full name of Windows Management Instrumentation, is part of Windows and assists organizations in monitoring and troubleshooting a large number of systems on a network. It’s not uncommon for the process to go out of control, however. You can tell if this is your problem by opening the Task Manager and looking for the WmiPrvSE.exe process. If its CPU usage is higher than a few percent, and you’re not running any program that would impact it, it’s not functioning properly. Microsoft has an official fix that will stop the problem for most users. If that fix doesn’t work, or you can’t download it, you can try manually restarting the service. Do a Windows Search for Services and, in the window that opens, look for Windows Management Instrumentation. Right click it, then select Restart. You can also stop the service entirely, if you desire. Finally, there’s a possibly that the service could be a worm or virus. You should see only one version of the process at any given time, and the process should stop if you halt it through the Services window. If you see two versions of it, or the process will not stop, run a virus scan immediately. Windows users occasionally run across high utilization by something called System Idle Process. This obscure process seems to hog all the CPU power it possibly can – terrible, right? Actually, this process is simply a thread that consumes processor cycles, which are not otherwise being used. The process is used because of some very arcane peculiarities in coding, which make it sometimes preferable, and even more efficient, for a processor to run something instead of nothing at all. This is not just a Windows thing, but Windows displays the process in task manager, so users see it and assume something is wrong. This is not to say you can’t experience performance issues when the System Idle Process is showing high “load,” but the issue lies elsewhere. In fact, you should expect to see this process report that it consumes 95% (or more) of your processor when your PC is at idle. If it’s not, something else is consuming processor cycles without your knowledge. A background process is a program that’s running on your PC, even though it’s not open in a window. A typical computer will have many background processes running at once, as Windows itself requires some to run. But as you install programs, over the years you may collect more and more, and eventually overwhelm your PC. You can check on this by opening Task Manager via a Windows Search for the same or by running taskmgr.exe. The Processes tab will appear by default, displaying not only overall CPU usage, but also the usage of each app. You should do this while no other programs are open to prevent confusion. Note the processes which appear to be using at least 10% of your processor’s capability on a regular basis. Now, exit Task Manager and open msconfig.exe via Windows Search or the Run dialog. Go to the Startup tab and find startup items correlated with the items that you noted. Uncheck them, click okay, and then restart your PC. This will stop those programs from launching at boot. Do you notice that your computer becomes slow at seemingly random times, and those times often correlate with high disk activity? Then your problem is probably your anti-virus! An anti-virus program, when actively searching your disk for a threat, can consume a surprising amount of processor load. This usually isn’t enough to slow a modern desktop or high-end laptop, but older or slower systems may noticeably slow under the strain. Fixing this is easy. Virtually all anti-virus apps come with a scheduling function that lets you adjust when it automatically scans. Change the schedule to a time when you’re not using the laptop, and you’ll no longer be bothered. On the other hand, malware could be the source of your issue. A system that’s infected may run processes in the background, or may attempt to spread itself by sending malware to others via your email, your network, or other sources. All of this requires processing power, which can translate to poor performance. Confirming an infection manually is not easy, and for the layman is more guesswork than anything else. If you don’t have an anti-virus, download a free malware application and run it. In fact, you may want to try several anti-malware tools, because malware that’s already installed has the advantage; it may be able to hide itself from any single anti-virus app. Once you’ve found the problem, you can remove it with the anti-virus app you used to scan. If that fails, read our malware removal guide; the tips there can help you exorcise whatever has possessed your PC. High CPU usage can be hard to track down. While the problems listed here are among the most common causes, but you may find that CPU usage is still an issue even after your try everything suggested above. If this problem still plagues you, head over to MakeUseOf Answers, where you can ask other readers for advice about how to deal with your particular situation. Control your Android phone or tablet using the mouse and keyboard on your computer. Whether you want to respond to texts using your computer’s keyboard or use your tablet as a second screen for research, this setup feels like magic when it’s working. Even better: you can copy text on one device and paste it on another. Synergy has long made it possible for Windows, Mac, and Linux computers to share the same mouse and keyboard. Doing so is seamless: move your mouse pointer past the edge of one screen and you’re immediately in control of another device. This is perfect if you have two computers on the same desk. It’s 2014, and most people don’t have multiple computers on the same desk — but it’s not unusual to have an Android phone or tablet alongside your computer. If you’d like to control that device using the mouse and keyboard you already control your computer with, the Android version of Synergy is exactly what you’re looking for. Synergy for Android requires your device to be rooted — there’s no way around this. It’s also buggy on some devices, shutting down regularly. Be warned: your mileage may vary. First things first: download the desktop version Synergy (http://synergy-project.org/) and the Android version of Synergy (http://synergyandroid.sourceforge.net/). You’ll need to install both. Now let’s get into terminology. There are two main pieces to a Synergy setup: the server, and the client. Don’t leave! It’s not as complex as it sounds. The “server” is the device you’re going to use to control your other device — that is, the device hooked up to your mouse and keyboard. In this setup, that probably means your computer. The “client” is the device being controlled by another device’s mouse and keyboard — in this case, probably your Android device. Your server is in the center; place your Android to whichever side you like. This is a Mac setup, but the options shouldn’t be different on a Linux or Windows computer. Give your Android device a name you’ll remember — something like “Android”. When everything’s setup up the way you like, take note of your server’s IP. Knowing that, hit the “Start” button and move on to Synergy on your Android device. Make sure the “Client Name” is the same one you used for your device when you were setting up your screen arrangement on your server. Use your server’s IP in the next box, and leave the Server Port untouched (assuming you didn’t change it). You should now be able to tap “Connect”. If everything is working, you can now move your mouse pointer from your computer to your Android device. On many devices this is crashing regularly as it is an alpha build and still in the works. Hopefully the client will receive updates soon. This setup becomes less useful if you screen turns off constantly, which is why I suggest installing Wakey (https://play.google.com/store/apps/details?id=com.doublep.wakey) on your device alongside Synergy. This will stop Android from shutting down your screen (http://www.makeuseof.com/tag/wakey-stop-android-from-turning-off-your-screen/), which is something you want if you’re going to use your device as a second screen. > What Can You Use This For? > Developing apps? Push them to your phone, then test them without the need to pick up your device. > Hate the desktop chat interface for Google Hangouts? Me too. Use your tablet instead. > Research on your tablet, write on your computer. 1.) They have a dinosaur! Yup! A dino's skeleton was found near their building in Mountain View, so Google has erected a giant t-rex skeleton and named it "Stan" in its honor. A powerful name for a powerful hunter. 2.) Google has added the Cherokee language into +Gmail. Wado Google! 3.) The Google homepage loads the fastest out of any other site, which is why many people use it to test their connection. 4.) Speaking of fast, right now there are 2 million Google searches going on per second. 5.) Google is a dog company, or so says their official code of conduct. They say they like cats, but due to the amount of pooches roaming their offices, they warn that their kitty friends might feel uncomfortable. 6.) Six billion hours of video are viewed each month on YouTube, which is owned by Google. That's about an hour for each person on earth. 7.) The "I'm feeling lucky" button costs the company $110 million a year. 8.) Google owns common misspellings of its own name as well, including gooogle.com, gogle.com, and googlr.com. They also own 466453.com which is google spelled out on the phone. 9.) Last year Google made $55.5 billion in advertising, which is about 90% of their profit. 10.) Sometimes Google uses the help of some hungry goats to keep their lawns in shape. 11.) One time, the daughter of an employee wrote to Google to ask if her father could have the day off for his birthday. They gave him the whole week! 12.) Google has photographed and posted 5 million miles of road for Google Street View. 13.) The first Google doodle was created when Larry Page and Sergey Brin went to Burning Man in 1998. (They drew the logo to let everyone know where they would be.) Groovy, man!